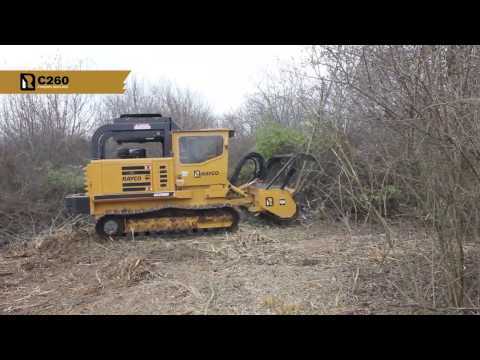 C260 Forestry Mulcher | Forestry Machines | Ohio | Rayco Mfg. The C260 is a mid-sized forestry mulcher that delivers 260 hp in a compact, low ground pressure package. This mulching machine is suited for clearing small trees, underbrush, and a variety of unwanted vegetation across a wide range of environments. The heavy-duty steel undercarriage and powerful final drives allow operators to tackle difficult terrain with confidence. Rayco’s exclusive elevated cooling design keeps engine and hydraulic temperatures within their limits in the harshest of environments. 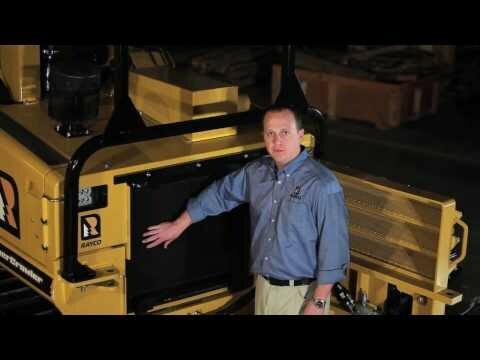 To minimize maintenance, a reversing fan can be activated from the cab to clear the limbriser debris screens. This helps to extend service intervals even when operating in hot, debris-filled environments. When manual cleaning of the debris screens is necessary, they are easily removable and the rear door opens to allow unrestricted access to the debris screen and engine radiator. The cabs are climate controlled and sealed from dust and debris to maintain operator comfort. Operators appreciate the high-backed, heated seat with adjustable armrests and air-ride suspension. For safety, the cab is certified to meet ROPS, FOPS, and OPS specifications and is equipped with a roof-top escape hatch. LED lighting facing front, sides and rearward. A backup camera enhances rearward visibility.